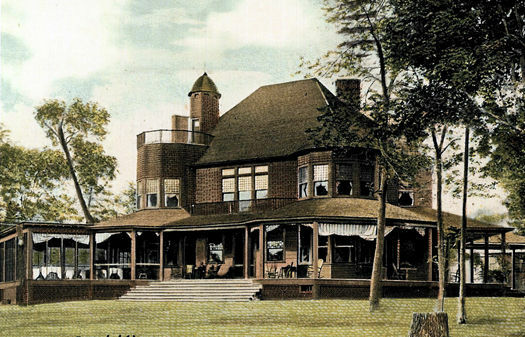 The Shingle-style design features thirty-six-over-one-light cottage windows, surrounding verandas covered by low, sweeping roofs, and a shingle exterior. An observation deck sits on a two-story polygonal tower, and a spiral stair topped with a bell-cast roof provides access to the deck. This stairway is nearly identical to the stairway in the Seligman Carriage House (1887). The clubhouse was replaced in the 1950's.